Moon of 3 Rings is classic Andre Norton. I enjoy Norton's writing and this novel doesn't disappoint in that aspect. (I'm starting to think that newer authors don't know how to do classic story-telling. It's a pity, some things should never die out. Nothing wrong with new ways of telling stories, mind you, but new doesn't equate to better, just different.) I decided to read Moon of 3 Rings because Brother to Shadows was recommended to me, and I thought these two novels were part of the same series, but it turns out Brother to Shadows is a standalone novel. 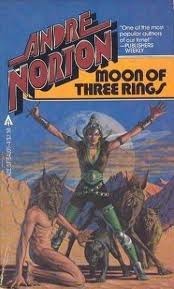 In any case, Moon of 3 Rings was another enjoyable read by Norton. It tells the story of Krip and Maelen. Krip works on a Free Trader ship. (You will notice that Cherryh's Merchanters are very similar to Free Traders. She does in fact list Andre Norton as an influence in her writing.) While looking for things to buy on one planet, Krip unwittingly gets caught up in a plot to seize power over that planet. In order to save him, Maelen gives Krip a new body. :-D There are, of course, reasons why she does this. First, she feels a small debt to him for he intervened on her behalf during a quarrel with another. Second, in saving Krip she hopes to save another. How Krip reacts to being put in a new body and what he does after is amusing. Norton has excellent pacing in her novels, which is what makes them fairly easy to read. I have yet to read an Andre Norton novel I didn't enjoy. Sign into Goodreads to see if any of your friends have read Moon of Three Rings.